Over the course of seven articles, we’ve covered many features of Adobe’s file management software: Bridge. The links to each article are listed below, along with short descriptions of the content contained. And don’t forget to bookmark this page so you can refer back to the series later! Even better, why don’t you download the eBook version of this series? Download Your Complete Guide to Adobe Bridge [PDF-30pg-3.3MB]. Oh, and one more thing… I found a nice collection of videos that cover various aspects of Adobe Bridge. So even if you’ve read through the articles, be sure to check them out again and watch the video I’ve embedded at the bottom of each post. PART 1 of this series covers basic introductions to the software and the concept of using Adobe Bridge as a photo management tool. We explain what the software is, what it can do for you, why it’s better than other software, and some basic computer requirements for running the application. If you’re totally new to this software or if you’ve never even tried it, start here and get your bearings. 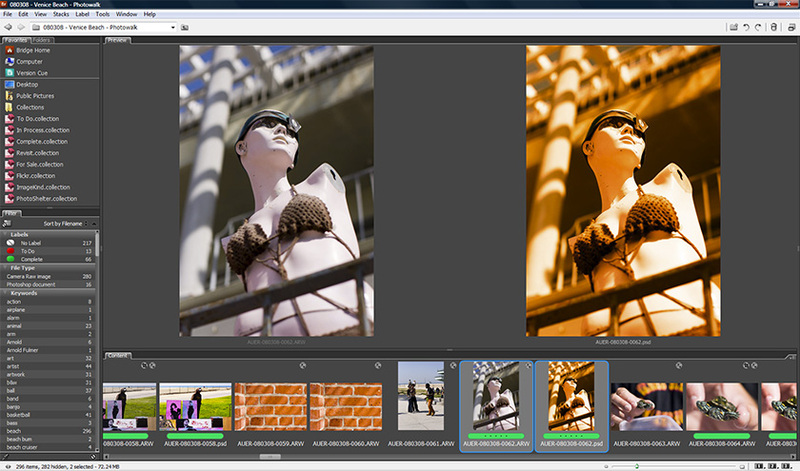 PART 2 of this series covers the concept of workspace within Adobe Bridge. We take a look at some default workspaces, the parts that make them up, and how you can use those parts to define your own custom workspace. Having a solid understanding of your worspace will present you with an increased comfort level with the software, thus increasing your productivity and effectiveness. PART 3 of this series goes into importing photos from your camera and a few features of Adobe Bridge that are associated with this action. 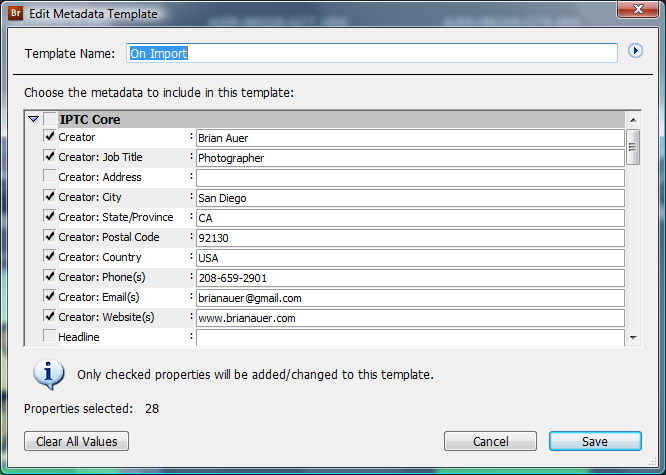 Each of the options within the import dialog are covered in detail, and we look at metadata templates and how they can be used to automatically apply extra information to your photos. PART 4 of the series talks about preparing our photos after import and before processing. We go over some basic workflow topics such as deleting photos, applying location metadata, basic keywording, and batch renaming of the files. Though not all of these steps are critical for every photographer, they are presented as a method of good practice. PART 5 in the series introduces the notion of bulk processing photos. Not intended to be an in-depth guide on the Adobe Camera Raw software, we walk through some of the basic adjustments that you’ll need to make your photos look better than when they came out of the camera. 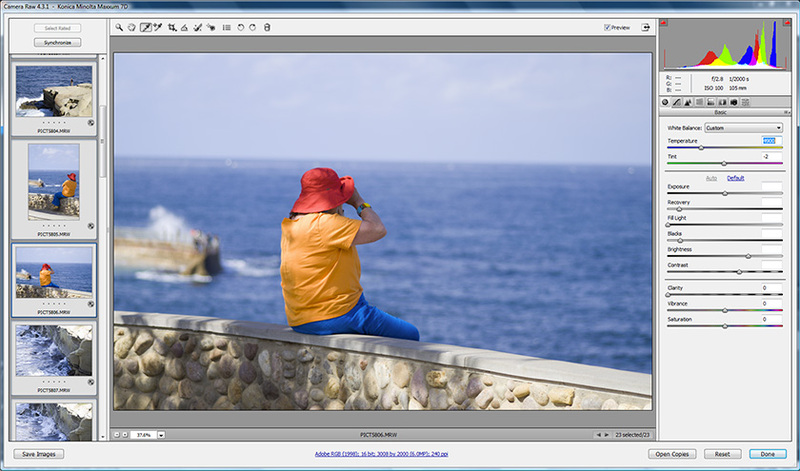 We also look at a method for applying image adjustments without even opening the files in ACR. PART 6 covers more detailed methods of organizing your photo collection. We look at some of the tools available in Adobe Bridge such as the star system, labels, and search functions. And as an extension of search capabilities, we talk about how to create collections and a few possible ways to use them for organizing and maintaining your archive. PART 7, the final installment of this series, lays out various tools and tricks not covered in the previous 6 discussions. We look at a few different ways of applying keywords, a more detailed discussion of the keyword panel, a good use for copy & paste functionality with ACR settings, batch processing with Photoshop via Bridge, and using stacks for those larger photo shoots. So if you haven’t been following along with the series, start digging in! And if you have been following, are there any major points that I missed or need to clarify? Any other questions about the software or my workflow? This entry was posted in Features, Photoshop Tips, Productivity and tagged acr, adobe, adobe bridge, adobe cs3, adobe photoshop, bridge, complete guide, computer, creative suite 3, cs3, digital, digital photography, ebook, file management, foto, free, free ebook, management, organization, organize, photo, photography, photos, photoshop, process, Productivity, software, structure on May 7, 2008 by Brian Auer. 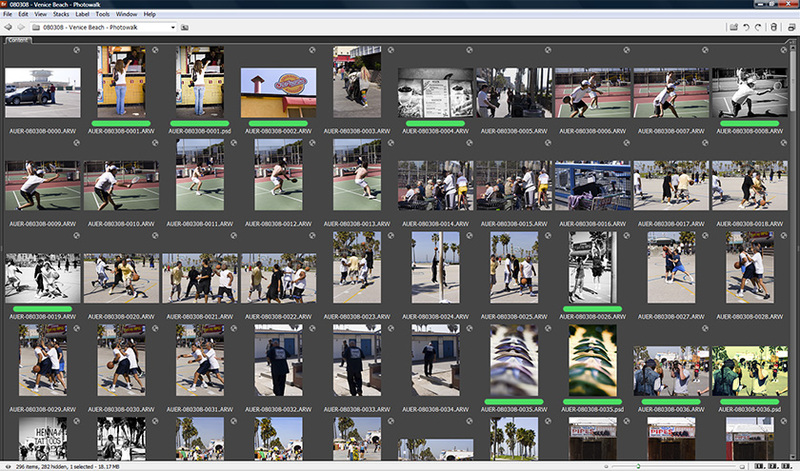 In the last part of this series, we went over Organizing your photos with Adobe Bridge. That marked kind of an endpoint for my basic workflow, but I still had a few Bridge features that I wanted to talk about and expand upon. This article will cover the Bridge keywording features, more productive ways to process RAW files, taking care of dust bunnies, hooking into Photoshop’s batch processing feature, and clearing up some visual archive clutter with stacks. This article also marks the near end for the whole series, and the final article will recap everything we’ve talked about. FOLLOW THIS SERIES OF ARTICLES! Back in the File Preparation article, I briefly mentioned keywording, but I didn’t talk a whole lot about how to do it. Keywording can be done in one of two ways with Adobe Bridge: typing semicolon-separated keywords into the Metadata Panel or clicking the check-boxes in the Keyword Panel. I use both methods depending on the situation. Keywording via the Metadata Panel is generally faster than searching through lists of keywords that you have archived. The problem with using this method is that it can’t be used when you have multiple images selected that already contain different keyword values. In the “Keywords” box you’ll see “(Multiple Values)” rather than the keywords. If you type anything in that box, you replace whatever information was there with the new information. So this method of keywording is good for groups of images with no previous keywords or single images regardless of their keyword situation. Keywording via the Keyword Panel is a little slower than typing things by hand. The nice thing about it, though, is that it can handle adding keywords to multiple files with pre-existing keywords (even if they’re different from each other). The other great thing about the Keyword Panel is that it serves as a keyword archive and it sort of reminds you to use keywords that you may have otherwise missed. I’ll typically use this method of keywording for the more detailed work after the images have already had a first coat of keywords. Organizing the keyword archive is fairly simple, but it’s not a completely automated process. When you keyword things by hand in the Metadata Panel, Bridge makes a note of this and places these keywords and phrases in your Keyword Panel under “Other Keywords”. These keywords can be moved around and stuffed into other categories for permanent archiving. To create a new category, simply click on the plus sign at the bottom of the panel for a “New Keyword”. This inserts a top level keyword that can be used as a category or grouping for other keywords. Once you have some top level keywords, you can add “New Sub Keywords” by selecting they keyword you want it under and clicking the plus sign with an arrow next to it. Sub Keywords can even have their own Sub Keywords, as shown in the screen shot for my “film” category. Moving and organizing existing keywords is simply a drag-n-drop operation. Keywords can also be renamed and deleted. The easiest way to build up your keyword archive is to do it as you go. Don’t bother spending hours plugging in keywords that you think you’ll use later — make good use of your time and do it while you’re actually keywording photos. And one last tip for the Keyword Panel… try to keep your keyword groups filled with less than 10 or 15 keywords. Any more than that and you can probably create some new sub-groups. Too many keywords in one list only makes it more difficult to find them. Do your keyword archiving correctly and adding those words and phrases will be a snap. You’ll be amazed at how many keywords you would have forgotten if you hadn’t run down your list and started diving into your categories and sub categories. As I mentioned in the File Processing article of this series, you can process multiple images inside of ACR to speed things up. Well, we can do the same thing without even bringing the images into ACR or Photoshop. If you have a group of photos with nearly identical lighting conditions and exposure, you can process one file and apply those settings to the other files from Bridge (I also mentioned this as an afterthought in the article). To review: after you process your file, select the thumbnail inside of Bridge and copy the “Development Settings” via the right click menu, edit menu, or press Ctrl+Alt+C. Then select the images you want to apply the settings to and use the menus or press Ctrl+Alt+V to bring up the dialog that lets you choose which settings to paste over. One of those settings is for “Spot Removal”. A neat trick you can do if you have a bunch of images with nasty spots on them, is to remove the spots on one image (via ACR’s healing tool) and do a copy & paste to the other images for only the spot removal. Now you don’t have to click every spot in every image. One thing I absolutely love about Bridge is the ability to batch process photos with Photoshop Actions… without manually opening those images in Photoshop and running the actions. If I process a photo with ACR and it doesn’t need to be opened in Photoshop, I don’t open it in Photoshop. But if I want to post that photo to Flickr at a smaller size, correct color space, etc., I have to use Photoshop. But since I created a few actions for resizing my Flickr photos, I can carry out that task as a batch process. Just select one or more photos that you want to batch, go to your “Tools” menu, navigate down to the “Photoshop” menu, and select “Batch…” to bring up a dialog box. In fact, it’s the same dialog box that you can access from Photoshop itself. The “Batch” dialog gives you options for the photo source, destination, and errors. Explaining every option in this dialog would constitute an article of its own, so I won’t mention everything about it. When I’m working with Bridge, my source will be set to “Bridge” — this just uses your previous selections for the batch. I also suppress open file dialogs and color profile warnings to ensure that the batch can run uninterrupted. These things can be dealt with in your Photoshop preferences. For my destination, I leave it as “none” when I’m just resizing for Flickr since my action saves the downsized file. Do you ever end up with hundreds of photos from a single shoot that end up in a single folder? Are any of those photos basically the same as some others? If you don’t want to get rid of those similar photos, you can at least condense your archive visually. Stacks are kind of like miniature folders, but without the folders. To create a stack, select the similar images and press Ctrl+G to “Group as Stack” or use your “Stack” menu or right click menu. This brings all the selected photos together and frees up some space on your screen. The stack can be expanded, condensed again, or ungrouped (check the Stack menu for the shortcuts). I don’t typically use them unless I have a lot of photos in a single folder. They’re handy if you like to go crazy with the rapid fire, because a lot of bulk comes from all those slightly different photos. That’s pretty much all I’ve got in me at this point. The last article in this series will be a recap, or course outline, for everything we’ve covered. I’ve only been using Bridge for a few months now, so I’m sure there are other features, methods, and tricks that I haven’t touched on. There’s always a possibility for a follow-up article sometime down the road. If you guys are interested, I could possibly start another series on Adobe Camera RAW. I’ve been using it heavily for a little while now, and I’m getting to the point where I’m comfortable with the basic stuff for working with color and black & white photos. It’s really not that scary! And it uses the same RAW processing tools at Lightroom. Here’s a video I found that goes well with the content discussed in this article. This entry was posted in Features, Productivity and tagged acr, adobe, adobe bridge, adobe cs3, adobe photoshop, bridge, computer, creative suite 3, cs3, digital, digital photography, file management, foto, keywording, keywords, labels, management, organization, organize, organizing, photo, photography, photos, photoshop, process, Productivity, software, stacks, structure, tips, tricks on May 3, 2008 by Brian Auer. In the last part of this series, we went over File Processing with Adobe Bridge. So now that the images have been skimmed and processed on a very basic level, it’s now time to start picking out the good ones and organizing. Before I spend any more time keywording or adding titles and descriptions, I thin out the herd so I’m not wasting time on photos that will never be used for anything. To do this, Adobe Bridge offers several tools such as stars and labels. Bridge also offers tools for finding images, so we’ll cover searching and creating collections. Adobe Bridge offers the ability to star your photos based on a five point scale. This gives you six levels of separation to use however you like. I personally don’t use the stars because my own organizing scheme works fine without them, but you may find a use for them. Once you add stars to a photo you’ll have the option of filtering your files by this rating system. I say that I don’t use the stars, but I actually utilize them as a temporary means of choosing files. If I have several photos of a very similar scene, I typically want to choose just one of them. So I add stars to photos in the group based on technical and artistic merits. This helps me narrow down my selection to just a few photos that can be compared side by side. After I choose the winner, all the stars are removed. Labels are similar to stars, but they’re not so centered around a ranking scale. I use labels heavily because they can be filtered easily and the colors associated with them make it very convenient to spot labeled photos and folders. In addition, the label system can be customized to match your needs. 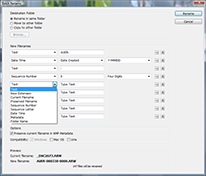 Labels can be applied via the right-click menu or by pressing “Ctrl+(6-9)” while one or more items are selected. The default labels offered in CS3 are No Label, Select, Second, Approved, Review, and To Do. These may be fine for your particular workflow, but I’ve customized the text of my labels to make them more recognizable. This can be done through the “Edit >> Preferences… >> Labels” dialog. I use To Do (need to be processed), In Process (started but not finished), Complete (finished processing), Revisit (reprocess later), and For Sale (anything on the market). I only apply labels to the photos I’m going to process on a deeper level, so very few of them actually get a label. I also label my folders with red, yellow, or green based on what I have going on inside. Red folders have not been processed at all. Yellow folders have some photos started. Green folders are complete and need no attention at the moment. And Blue folders were complete but need more attention now. So while looking at my folders, it’s easy to see what needs working on and what doesn’t. Once inside of the folder, it’s a simple matter of selecting the “To Do” or “In Process” filter to see what needs work. The filter is also handy for bringing up the completed photos in case I’m looking for new material to sell. Filters are fine if you’re working in a single folder of photos, but sometimes you need to expand your reach to a set of folders encompassing multiple photo shoots, months, or years. Finding what you’re looking for is no problem if you’ve done your job with adding keywords, labels, and other metadata. The Source option will be pre-filled with your current location, but you can also choose other common locations or browse for a specific directory. Criteria can be added or removed to suit your needs, and there are a vast number of metadata options that can be used for the search. In my example, I’m searching for a “beach” photo that I need “To Do”. There are several other options for the Results that dictate how the search behaves. When you’re ready to search, hit the “Find” button. If you find yourself conducting the same search over and over again, a collection is what you need. 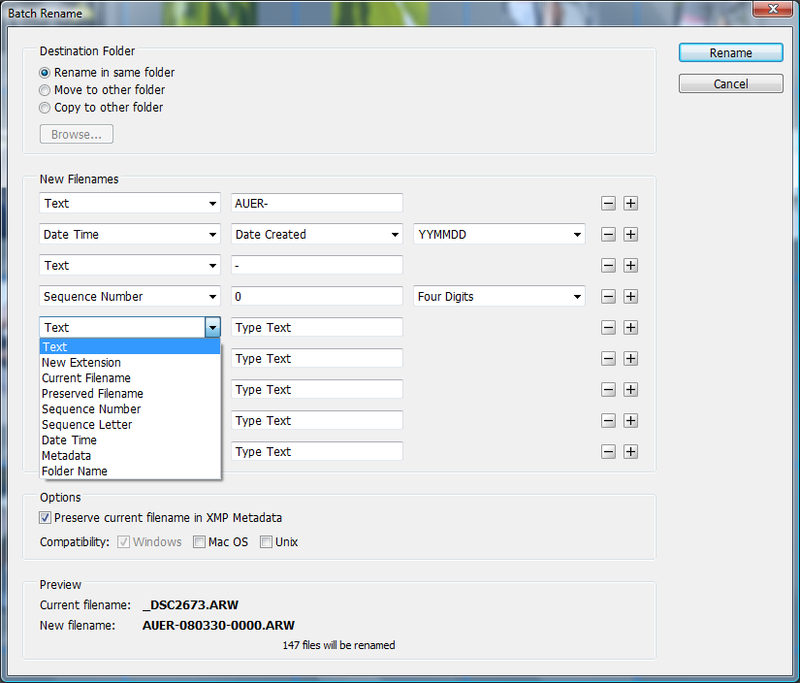 Collections are like saved searches, but can be carried out from any location with the same criteria. 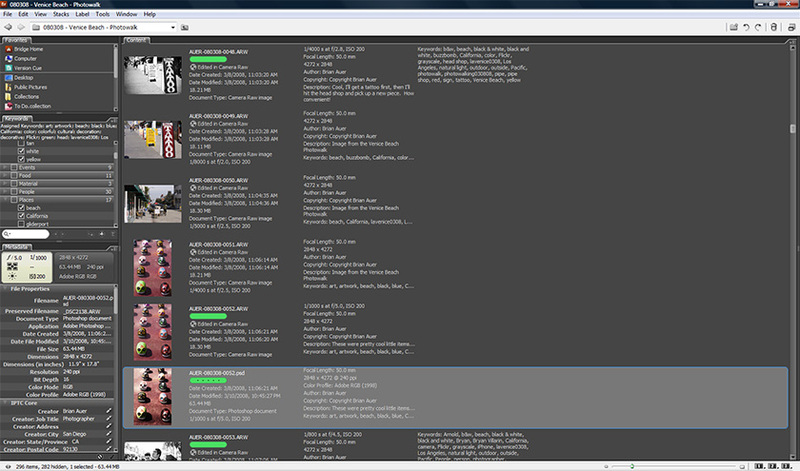 The results are similar to albums in other organization software, but it’s not quite a drag-n-drop operation. For example, I’d like to be able to find all of my “To Do” photos without having to look in each folder and filter things down. By creating a collection with the criteria for the label “To Do”, I can run the collection for a set of photo shoots, an entire year, or the whole archive. You can also create collections to search for specific keywords or other items in the metadata. To start a collection, follow the instructions for a regular search. But instead of hitting “Find” we’re going to hit “Save As Collection”, which will bring up a save file dialog box. Choose a location for your collection, give it a name, and save it — I store mine in a top level directory called “Collections” within my photo archive. Also in that save dialog, you’ll see a couple of other options down near the bottom. I typically select the “Start Search From Current Folder” option so I can execute the collection from any location. To run a collection search from any directory, you’ll need to also add that collection to your “Favorites” so you can access it while browsing your folders. When you get to the level that you want to search from, just run the collection by double clicking it and the search will begin from your current location. Some collections I’ve put together include one for each of my labels and one for seeking images that I’ve posted on various websites (I keyword them with things like “Flickr” and “ImageKind” after I’ve posted them online). Features such as searches and collections only work well when you’ve put the effort into your photos up-front. Keywording, labeling, starring, and adding other metadata is a key process that has substantial benefits down the road. I’m sure we could drag this thing out for many more weeks, but I think we’ve covered a majority of the key points with the software. In the next part of the series, I’ll talk about various tips, tools, and techniques for using Adobe Bridge efficiently and effectively. This entry was posted in Features, Productivity and tagged acr, adobe, adobe bridge, adobe cs3, adobe photoshop, bridge, collection, collections, computer, creative suite 3, cs3, digital, digital photography, file management, foto, keywording, keywords, labels, management, organization, organize, organizing, photo, photography, photos, photoshop, process, Productivity, search, searching, software, structure on April 24, 2008 by Brian Auer. Last time we talked about preparing our files to be processed. So now it’s finally time to start doing some photo editing! In this article, we’ll be focusing on the first round of processing using Adobe Camera RAW software. Be aware that I’m using my own RAW workflow as an example for our series of articles. There are some differences between RAW and JPEG, and I’ll try to point them out along the way. The way that I intend to present this material should help close the gap between the two formats, but call me out if I miss something on the JPEG side of things. In our last article, I mentioned I would be using a RAW workflow for this step. Processing RAW files is really a snap with Adobe Camera RAW (ACR), and it doesn’t have to take a lot of extra time or effort. Also in a recent article, I showed the difference between RAW and JPEG, unprocessed and processed with ACR. The purpose of this article was two fold: to show the difference between JPEG and RAW, and to introduce the notion of processing JPEG files with a RAW processor such as ACR. So regardless of which format you prefer, the following steps are still applicable. 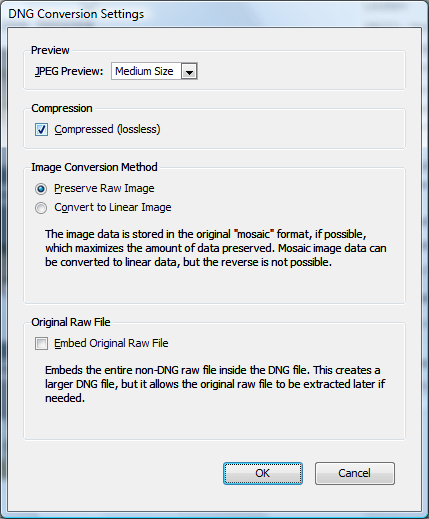 Do note though, that processing JPEG files with ACR is a new feature found in the CS3 bundle. If you recall in our last installment of this series, I pointed out that I keyword my photos with lighting conditions. I also said that this would save us some time when it came to processing the files. Here’s why. Similar lighting conditions will result in similar white balance. By grouping photos according to the lighting condition, we can process each group more quickly by bulk processing the white balance settings. With that in mind, to begin the bulk processing I’ll filter my photos by lighting condition, select everything that is similar, and open them in Adobe Camera RAW. This can be done with a right-click and choosing “Open in Camera Raw…” or via the menus (File >> Open in Camera Raw…) or by pressing Ctrl+R. This loads all the selected images into ACR, and you can see their thumbnails at the left of the screen. 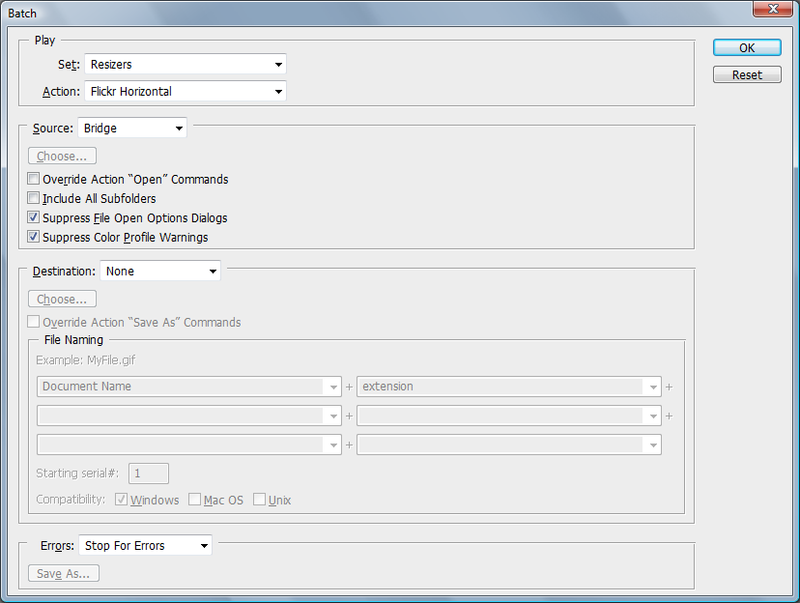 On the ACR basic adjustments panel, you can basically start at the top adjustments and work your way down. So white balance is one of the first things you want to establish. There are four basic ways to set white balance, but whatever method you choose, it would be wise to have a calibrated monitor. 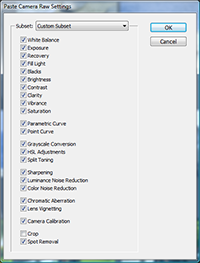 The first (and simplest) method for setting white balance is with the “Auto” setting. This tells ACR to do its best in determining the correct white balance for each photo on an individual basis. The second method for setting white balance is with one of the “Presets” (not available with JPEG) — daylight, cloudy, shade, tungsten, fluorescent, etc. These settings are usually close enough to use as a starting point, but I’ve noticed that they often need some tweaking to get them spot on. 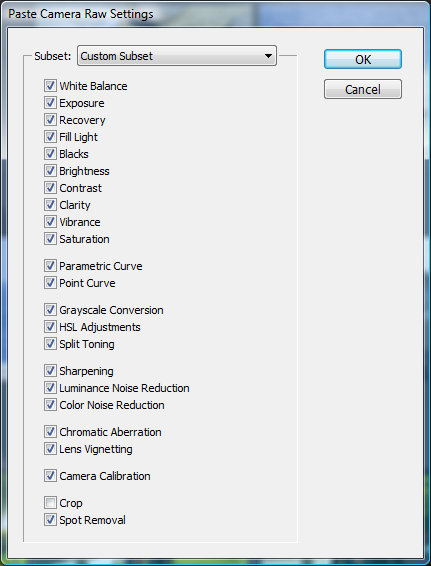 The third method for setting white balance is with a “Custom” setting on the adjustment sliders. Here, you can warm things up (yellow) or cool them down (blue), and add some green tint or magenta tint. With this method, a calibrated monitor is especially important. 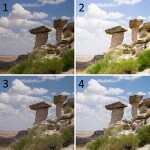 The final method for setting white balance is by sampling a part of the photo. To do this, use the “White Balance Tool” and select something that you know to be neutral gray. This is why studio photographers will shoot a “gray card” prior to photographing their subjects — it makes setting the white balance a no-brainer. I typically start with a preset and adjust from there. Sometimes I’ll use the sampling method, but I don’t always have a good neutral source to work with. But whatever I happen to do, I always flip through the images in ACR to double check my bulk settings — there are always a few that need some further tweaks. OK, so the white balance is set and we’re ready to move on. The next step is to adjust the exposure settings (the middle portion of the “Basic” palette). Here, you can adjust your exposure, recovery, fill light, blacks, brightness, and contrast. I won’t get into what each of those adjustments does, but I encourage you to experiment with them. Since I’m only doing a first round of processing on my images at this point, I don’t spend a ton of time adjusting these values. The purpose of this step in the workflow is to get the white balance correct and to make the images look more “natural” rather than looking like the dull RAW files that come out of your camera. So… I usually just select all the images I’m working with and hit the “Auto” button (and as with auto white balance, each image is set individually by ACR). This gets things to about 90% of where they need to be. Certainly, many of the photos could benefit from more detailed adjustments, but it’s not worth the time and effort if a good portion of your photos will never be seen by anyone else. Once again, I take a quick run-through of all the photos to make sure the software didn’t make some terrible choices. Every once in a while it does, and I’ll have to manually adjust the photo to bring it to a presentable state. But again, don’t get carried away with this stuff — it’s supposed to be quick. After applying the basic settings for white balance and exposure, you can jump into some other things — I typically don’t, but you might want to depending on your camera and your photos. You can apply bulk adjustments to your saturation, tone curves, and sharpness if you’d like. Also, if you use a lens that needs consistent corrections for fringing or vignette, you can bulk process your images to save a lot of time. Honestly though, beyond white balance and basic exposure settings, I don’t mess with much. All I want at this point is to be able to view the photos in a more “natural” state so I can determine which photos will require more of my time. When you’re all done making bulk and individual adjustments in ACR, simply select all the photos and hit “Done”. This will apply those settings to the XMP metadata and Bridge will update the previews for those photos. So you’re not actually making any changes to the photos, regardless of whether you’re using JPEG or RAW. The best part is that the new adjustments are stored along with the original settings. If you open one of your images back up in ACR it will look exactly as you left it, but you can also revert back to “As Shot” by using the pull-down menu on the palette menubar and choosing “Camera RAW Defaults”. Let’s say you either don’t want to pull hundreds of images into ACR at once, or you simply forgot to include some photos. With Bridge, there’s an easy way to apply those processing adjustments outside of Adobe Camera RAW. This method also works well if you just want to change white balance settings across multiple images. First, you need to select an image that you want to copy the settings from. Once you do that, you can copy those settings to memory by pressing Ctrl+Alt+C or by using the right-click menu or “Edit” menu and looking for the “Develop Settings” option. Now, select one or more images that you want to apply some or all of those adjustments to and press Crtl+Alt+V (or use the menus again) to paste the settings. This will bring up a dialog box that asks you which settings and adjustments you’d like to apply. Pick the ones you need and apply them — that’s it! Another thing this is useful for is spot removal. I won’t get into it, but if you have a dirty sensor it’s something you might look into to help you tame those dust bunnies. After running through your various lighting groups, you should have a full set of processed photos. They won’t be fully processed, but they should be in a better place than when you started. For some of you, this level of processing suits your needs just fine. For others, you’ll want to really dig into things and give some special attention to certain aspects of the photo. In the next article of this series, we’ll go back to Bridge and take a look at how to efficiently keep track of your photos in their various stages of post-processing. If you’re anything like me, you’ve got some photos that are waiting to be worked on, some that are being worked on, some that are complete, and some that you want to revisit. I’ll show you how I use labels and collections to keep track of things. This entry was posted in Features, Productivity and tagged acr, adobe, adobe bridge, adobe camera raw, adobe cs3, adobe photoshop, bridge, computer, creative suite 3, cs3, digital, digital photography, editing, exposure, file management, foto, management, organization, organize, photo, photo editing, photography, photos, photoshop, post-process, process, Productivity, software, structure, white balance on April 9, 2008 by Brian Auer. Last time we talked about importing photos through Adobe Bridge. Now that we have our photos transferred over with some basic metadata embedded, we can start preparing for processing, selection, and finalization. In my workflow, file preparation consists of knocking out the duds, more metadata, basic keywording, and file renaming. Getting rid of non-usable photos helps to free up clutter and disk space. Extra metadata can include things like location and lighting. Basic keywording helps to initially separate and group photos. And file renaming adds information that’s more visible to anybody handling your files. In total, these steps should take no more than 10 minutes of your time, even if you have several hundred files to work with. Before anything else, I always take a quick run through the photos and delete anything that needs to be deleted. Why? Well, there’s no sense in spending the extra time on those files working with metadata and processing — they’re only going to get in the way. Not only that, they take up extra disk space and clutter the folder. I’m not talking about deleting the “sort of bad” photos — those are fine to hang on to sometimes. The photos I delete are those either completely out of focus, exposure is WAY off, or maybe something that a person or object unexpectedly blocked a majority of the scene. I also delete duplicates. Sometimes I’ll shoot in rapid-fire mode and I’ll end up with several of the same photos. I’ll shoot this way for several reasons: moving objects, low shutter speed, accidental, etc. If I have five photos of basically the same thing, I’ll look at them in detail and keep the best 1 or 2 out of the bunch. 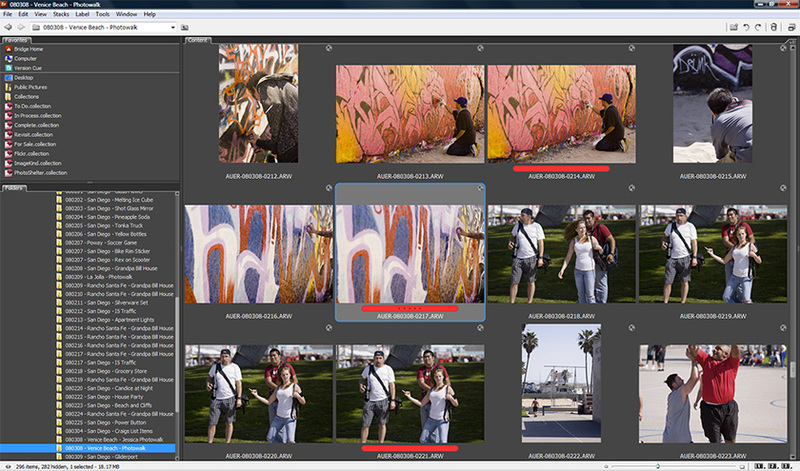 Adobe Bridge offers two methods of “deleting” photos. 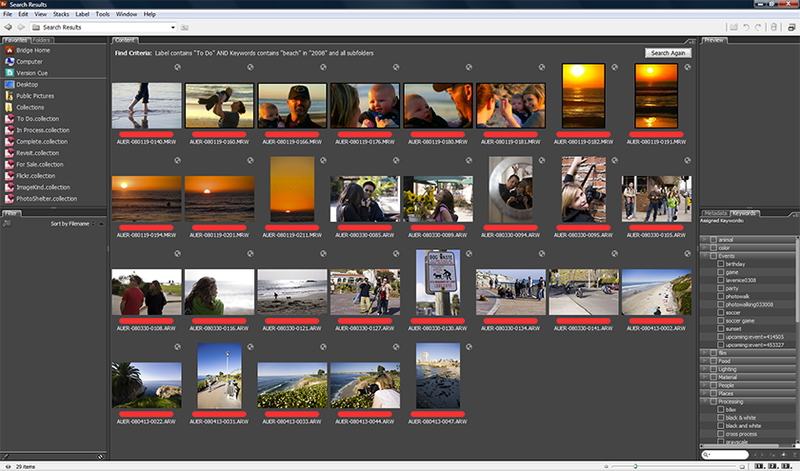 If you select a photo and press the “Delete” key, you’ll probably see a dialog box similar to the one I’ve shown. By default, Bridge will “Reject” photos when you press the “Delete” key. This just removes the thumbnail from Bridge but leaves the file alone on the hard drive. To completely delete a photo, hold down the “Ctrl” key (Cmd for Mac) before pressing the “Delete” key. I typically group my photos by a particular photo shoot — so every photo in a given folder is from the same geographic location. Even though I include this information in my folder naming convention, that metadata is not yet contained in the photo. 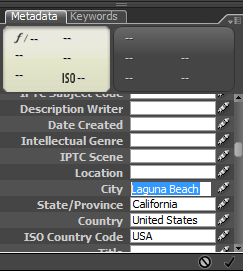 In the IPTC Metadata, there exist several fields for geographic location data. You can place the country, state/province, city, and location within a city. I generally fill in everything I can, sometimes leaving out “Location” and “City” depending on where I shot the photos. Applying these values is a snap — just select all of your photos for a particular location, set the values in the Metadata panel, and click the apply button at the bottom. Do this step with every set of photos and you’ll have a fairly quick method of locating images by location with a simple search or filter. 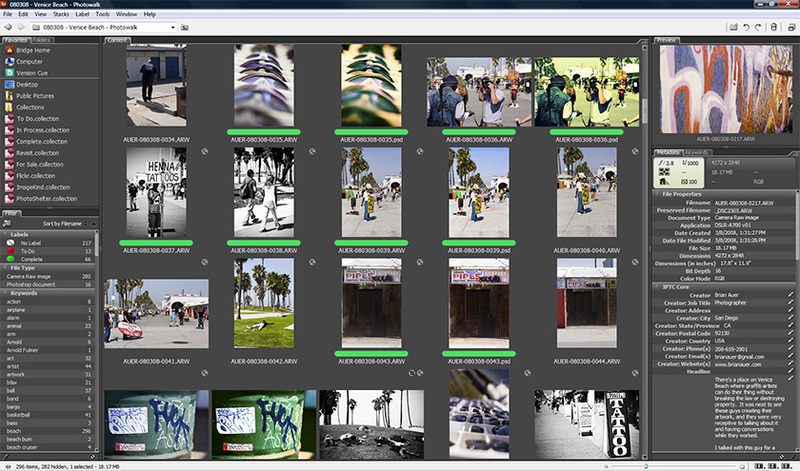 Aside from location metadata, I like to start on a few choice keywords prior to processing the files. I have a couple of keyword categories in my Keyword panel for lighting conditions. I apply these “lighting” keywords prior to processing because they help me separate similar files based on the approximate white balance. This will be important when we pull files into Adobe Camera RAW. I tag photos for things like “natural light”, “artificial light”, “flash”, “studio”, “sunlight”, “shade”, “fluorescent light”, etc. 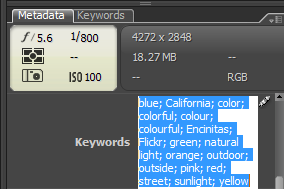 These keywords give me a good idea of which photos can be processed in batches for white balance. This can be a huge time-saver if you have hundreds of photos shot with very similar lighting conditions. At this point, you could do the rest of your keywording — it won’t hurt anything. I like to get my files processed as quickly as possible so I can view them in a more natural state. But if you like to dig right in to the task of keywording, nobody’s stopping you. In the past I was never big on renaming my files — I just didn’t see any need for it. Neil changed my mind with his series on photo organization. I like the naming convention he presented (NAME-YYMMDD-XXXX) and it helps me identify my photos with more ease. 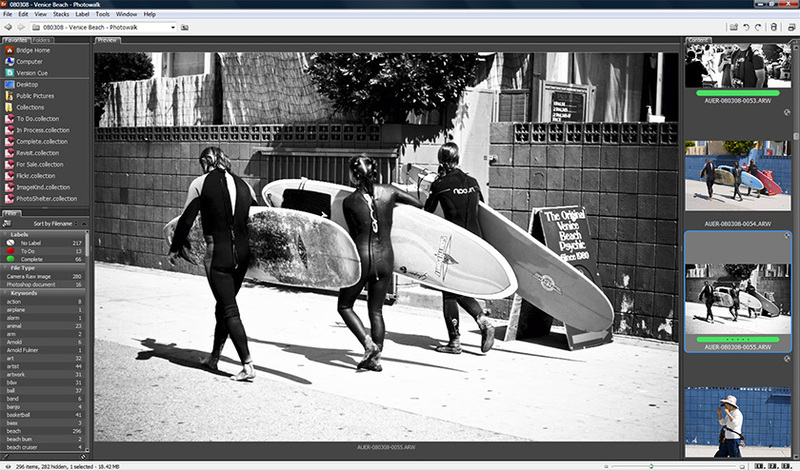 Adobe Bridge offers the ability to batch rename your photos with a powerful interface. After selecting the files you wish to rename and entering the “Batch Rename” dialog via the right-click menu or in your “Tools” menu. The dialog gives you the option of where the new files will placed, how to rename them, previous filename preservation, OS compatibility, and it shows a nice preview of what the new names will look like. There are nine different rule-types that can be applied in sequence with each other and combined to create a single filename. As you can see by my example, I use “Text” (AUER-) + “Date Time” (YYMMDD) + “Text” (-) + “Sequence” (XXXX) to create the naming structure that I want. You should be able to get whatever filename you need based on combinations of these nine rules, and you can even include several pieces of metadata if you so choose. To add more naming rules, click the plus sign on an existing rule and add a line below it. To remove rules, click on the minus sign. In the next part of this series I’ll FINALLY get around to processing my images. For that step I’ll be showing a RAW workflow and comparing it with a JPEG workflow. Fortunately for CS3 users, the two are very much the same. And for those who aren’t convinced that RAW is king, I’ll show some examples of the differences between working with RAW files and JPEG files. This entry was posted in Features, Productivity and tagged acr, adobe, adobe bridge, adobe cs3, adobe photoshop, batch, bridge, computer, creative suite 3, cs3, digital, digital photography, file management, foto, keyword, keywording, management, metadata, organization, organize, photo, photography, photos, photoshop, Productivity, rename, software, structure on March 31, 2008 by Brian Auer. In the last post of this series we talked about the workspace of Adobe Bridge. Various layouts, panel functionalities, and a few of the basic controls. Now that we have that under our belts, we can begin our journey into actually using the software. Like I said before, I’ll be stepping through my workflow from the beginning — so we’ll start with importing our photos from the camera to the computer. I realize that there are probably several dozens of methods for importing photos, and we all have our preferences for one reason or another. 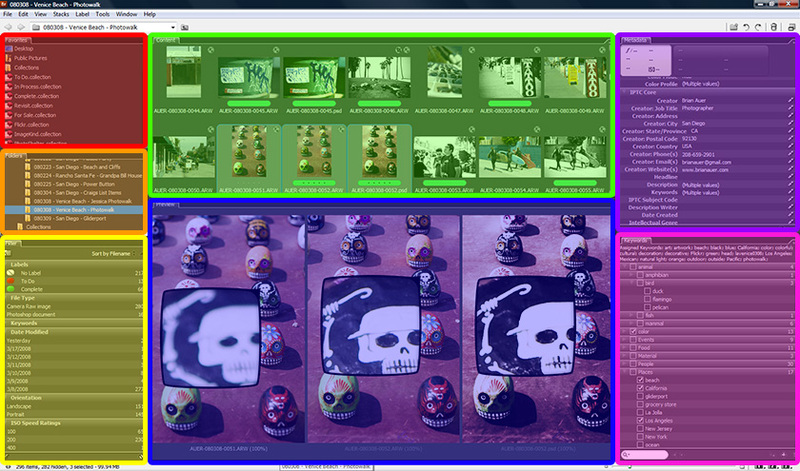 What I’m going to show you is how Bridge can make quick work of importing photos. Not only that, Bridge has the capability to automatically alter the files as they arrive, thus increasing your productivity. Wait a second… aren’t we supposed to be pulling in those files? Not yet padre. If you don’t have any idea what a metadata template is, or if you haven’t set one up, do it now — immediately. This little step will save you a ton of time and it will make your files far more rich with metadata. Basically, you can create a template filled with IPTC metadata that can be applied to your photos as they are imported to your computer with no extra effort. 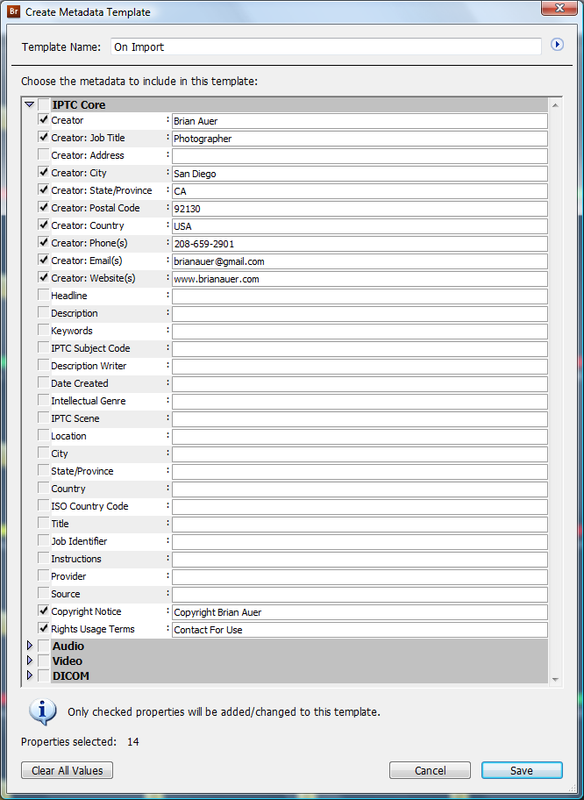 If you look under your “Tools” menu you’ll see a “Create Metadata Template…” option. Click on it. A dialog will pop up that contains empty fields for all of the IPTC, Audio, Video, and DICOM metadata. The last 3 aren’t of terrible use to photographers, so I’ll focus on the IPTC fields. To create the template, simply fill in the parts that you’d like to be applied to EVERY photo you import under this template. I choose to fill in things like my name, location, email, phone, website, and copyright info. Most of the other fields will either vary photo to photo, or it just doesn’t get used. I’d suggest that you create at least one generic template for yourself, and you might even want to create others. You could create templates for different clients, cameras, locations, or whatever. OK, so when you’re done, give your template a name and save it. Now we’re ready to import. Prior to importing, you’ll need to connect your photos to your computer. Go ahead and do this however you normally would. If you use a card reader, plug in the card. If you connect the camera through a USB cable, plug in the camera. Now ignore or close any pop-ups or dialogs that show up from the operating system or other software — we’ll be pulling in the images through Bridge to your computer. Also let me make this clear: Adobe Bridge does not store your files or place them in a database — the software is only a functional window to your existing file structure on your hard drive. To open the Photo Downloader dialog, look under your “File” menu and choose the “Get Photos From Camera…” option. Initially, you may be looking at a blank window. You’ll need to choose the source location of the photos in the upper drop-down menu. Once you choose the source, the preview window should populate with thumbnails of your photos with little check boxes below them. Only the items you have checked will be imported when you press “Get Photos”, so you could split up your download into multiple folders if you had several days worth of images on a single card. In addition to choosing which photos to download, you have three sets of options that tell Bridge what to do with those photos as they are downloaded. The “Save Options” have to do with file and folder names. First, browse for a location on your hard drive that you’d like to import the photos to. 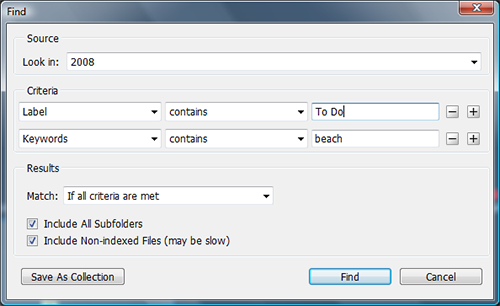 Then choose a method for creating a subfolder if your main location is merely a directory of subfolders. 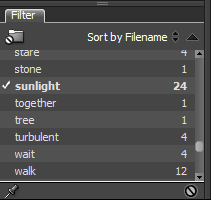 Bridge gives several options for creating subfolders (all having to do with the date), but I use the “custom” option so I can use a more descriptive folder naming convention. You can also choose to rename your files on the fly with some simple rules, but I choose to bypass this option so I can take advantage of the more powerful batch renaming function within Bridge (we’ll get to this in the next part of the series). The “Advanced Options” are fairly self-explanatory. There’s an option to open Adobe Bridge after importing, which is only useful if you use the import dialog without opening Bridge first. You can also save copies of the files to another disk location. 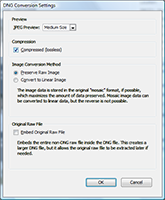 The one option that might be useful, depending on your preference for file formats, is the “Convert to DNG” function. I won’t get into DNG files right now, but just recognize that they’re a type of standardized RAW file. If you typically convert all of your RAW files to DNG, this little option will take care of it for you while your photos are downloading. 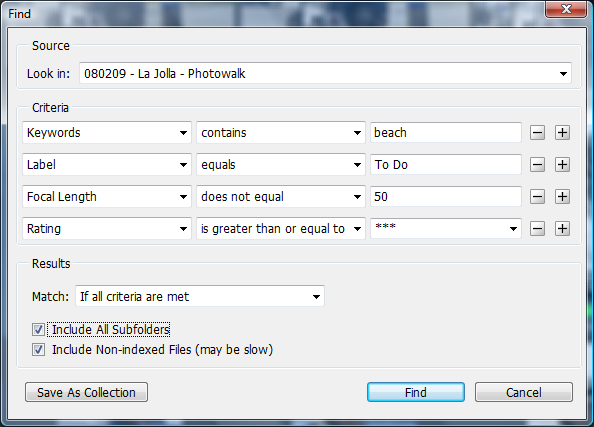 The last option in our “Photo Downloader” is for applying metadata. So all that junk up above about creating a metadata template… this is where we use it. Simply select your appropriate template, and all of your photos will have the metadata attached as they make their way onto your computer. Do note that the option to apply metadata is only available in the advanced dialog, so if you’re seeing the standard dialog without thumbnail previews you’ll have to switch over. After all of your options are set, press the button and let Bridge do its job. Once the photos have been downloaded, they’ll be located on your hard drive right where you specified. And if you check on your metadata (and if you used a template), you should see the appropriate fields populated. So let’s say you really like this metadata template thing. Awesome, but what about all those photos that already exist on your hard drive? Since you just created your template, those photos never had a chance to get all that extra information applied to them. No problem, we can fix it. 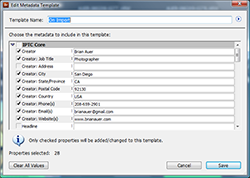 All you have to do is jump into a photo directory and select all of the photos you want to apply the template to. Now look under your “Tools” menu and click on the “Append Metadata” or “Replace Metadata” option followed by the template you want to use. Appending will only replace the empty fields with data from the template, while Replacing will overwrite anything that was already there. So there you go, now you can use your template(s) to reach back into your archives and populate some of that metadata you had previously left blank. In the next part of this series, I’ll move on to my next few steps in my workflow. After importing my photos, I immediately knock out any complete duds. Then I rename all of my files with a handy batch process. And before moving on to the next big step, I apply a few keywords to help me with the task of processing my RAW files. So stay tuned, because we’re just starting to hit the fun stuff! This entry was posted in Features, Productivity and tagged acr, adobe, adobe bridge, adobe cs3, adobe photoshop, bridge, computer, controls, creative suite 3, cs3, digital, digital photography, file management, foto, import, importing, iptc, management, metadata, organization, organize, panels, photo, photography, photos, photoshop, Productivity, software, structure, template on March 26, 2008 by Brian Auer. In the last post of this series we talked about the basics of Adobe Bridge. What it is, what it can do, why it’s a good thing, and some of the computer requirements. I’m sure some of you are quite anxious to start digging in to the finer details of the software, but before we go anywhere I want to talk about the Bridge Workspace. A workspace refers to the layout of features and controls available in a piece of software. 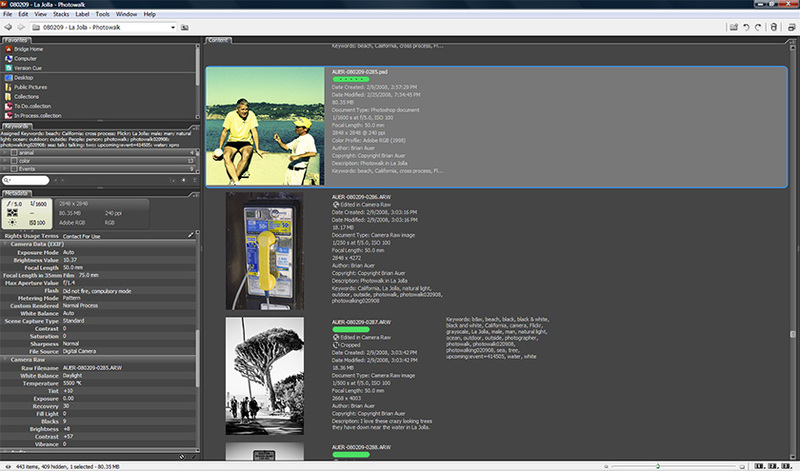 Adobe Bridge has several predefined workspaces, each having a unique purpose in the photo management process. Different workspaces mean different views, panels, and controls. I’ll lay out the various workspaces, then we’ll dig into each of their components (many of which are shared across workspaces). 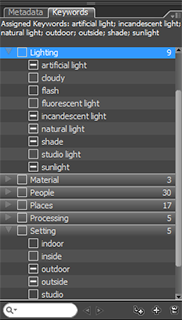 Adobe Bridge has six predefined workspaces. You can also create your own space and save it if you find something that works better for you. And here are a couple of my own custom workspaces. They’re only slightly different than the predefined workspaces, but sometimes those little things can make a difference in your productivity. I’d encourage you to make your own workspace by dragging the various panels around until you find something you like. After looking at a few of these workspaces, you ought to notice that they consist of the same parts (aka “panels”) but rearranged. So let’s dig into those panels and explore what they do. For the purpose of this section, I’m using a screenshot of a workspace that has all seven panels visible. I don’t usually work with such a layout since tabbed panels are more space efficient. Refer to the colors in the image as I step through each of the panels. Similar to a “Favorites” or “Bookmarks” folder on a web browser, you can keep your most helpful items in here. Favorites can include folder locations, files, collections, previous searches, Version Cue, Adobe Stock Photos, downloaded comps, Bridge Home, and a bunch of other stuff that can be set in the general preferences (Edit >> Preferences… >> General). Personally, I find it handy to keep my most used collections in there (we’ll get to what those are another day). If you’ve ever browsed a directory tree, this one should look familiar — It’s just your folder structure on your hard drive. Folders can also be navigated in the “Content” panel, but the “Folders” panel provides a quick method of changing locations. I love this panel. I think it’s one of the best things in Bridge that sets it apart from other software. Filters are a way to exclusively view photos that meet a specified criteria. Want to see only your RAW files? Or how about images with a certain keyword? Maybe you’re looking for an image with a vertical orientation? Easy — just click on the filter and you’ll only see those images. If you sort-of know what you’re looking for, filters will allow you to find it a hundred times faster than scrolling through tons of images. The content panel is a window to the contents of your current folder, not unlike a file browser on your OS. But the content panel provides more functionality than your operating system can. Thumbnails can be resized from very tiny to very large, and they can be set to scroll horizontally or vertically. Bridge caches the thumbnails for super-speedy viewing. Thumbnails also show star ratings (which I don’t typically use), labels (which I definitely do use), filename, and a few other things depending on what the photo is and what’s been done to it. 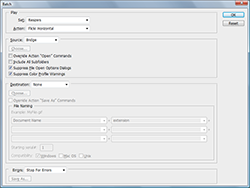 This panel also allows you to access a large number of controls and commands via the right-click menu. The preview panel is similar to a slideshow, but a little more powerful. 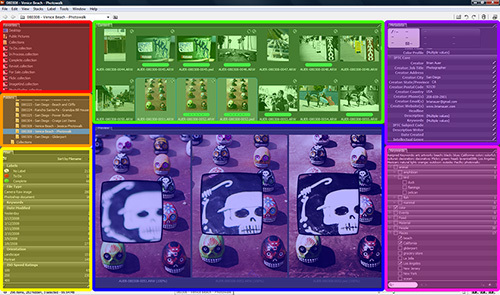 It’s very handy for inspecting images at larger scales, comparing multiple images side-by-side (just select multiple files in the content panel), checking for sharpness and whatnot between 100% and 800% zoom (click on the image and a magnifying loupe pops up – scroll to change the zoom). The other great thing about using this preview is that everything is color manged, so your Photoshop files and RAW files will appear EXACTLY the same as in Photoshop. When I first import photos this is where I spend most of my time. The metadata panel provides you with access to all the file info, EXIF, IPTC, RAW settings, and a bunch of other stuff you never knew existed. What’s really great is that you can select a bunch of images and apply keywords, descriptions, copyright info, location info, and other things as a batch. The keywords panel is similar to the metadata panel, but it’s sole purpose in life is to organize and apply keywords. Common keywords can be grouped, categorized, applied in batches, and renamed with this visual interface. Keeping your keywords organized and up to date can prove to be a major benefit while keywording images — I’m alway amazed at how many more keywords I can apply by just taking a quick scan through my lists. So that’s pretty much it for the panels. I touched on a couple of usage tips and tricks, but we’ll go much deeper in subsequent articles. To prevent this article from getting too long, I’m not going to visually highlight all of the little buttons and menus as I did with the panels. I would encourage you to explore the software interface on your own, looking for the little icons located below the menu and at the bottom of the window. Some of the panels also have buttons and drop-down menus that provide added functionality. Right-click menus contain another wealth of options to assist you with organizing, searching, and processing your images. One major item worth mentioning is the “saved workspace” button set. Look down at the lower right of the window — you should see a “1″, “2″, and “3″. Hold down on one of them and select a preset (or custom saved) workspace. Set all three for the ones you like the most and now you have a workspace quick-launch — hit the button and away you go! At this point I think we’re quite familiar with the Adobe Bridge interface basics. From here out I’ll be walking through my typical workflow and highlighting all of the things I commonly use the software for. 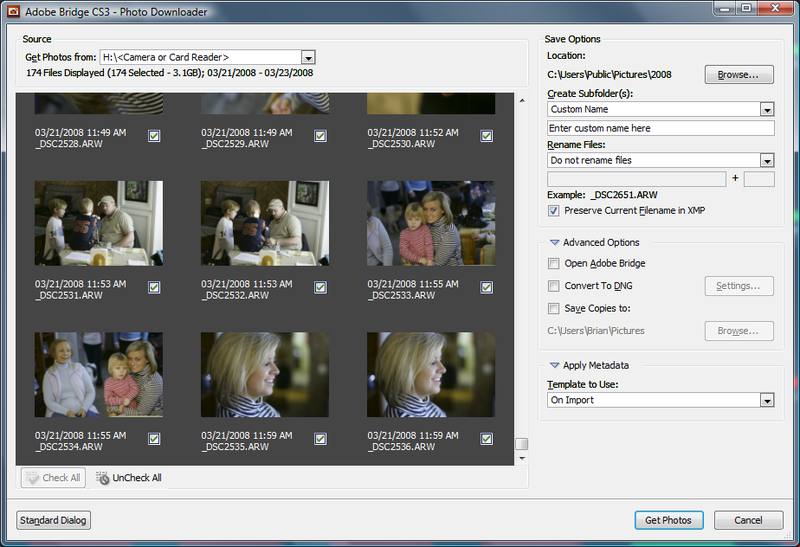 In the next article we’ll talk about importing photos from your camera or card reader straight into Bridge. This is a very important step, since it can save you lots of time once you get those file on your computer. So stay tuned! For those of you looking to obtain Adobe Bridge: Claudius Coenen mentioned on the last post in this series that there is a way to get Bridge for free. Apparently if you download the Photoshop CS3 30-day trial, the license will expire on Photoshop but not on Bridge. Now of course one of the major benefits of working with Bridge is the ability to interface with Photoshop and ACR, but it’s also handy as a standalone file management tool. Also note that I haven’t tried this out so I can’t say that it works for sure. This entry was posted in Features, Productivity and tagged acr, adobe, adobe bridge, adobe cs3, adobe photoshop, bridge, computer, controls, creative suite 3, cs3, digital, digital photography, file management, foto, management, organization, organize, panels, photo, photography, photos, photoshop, Productivity, software, structure, workflow, workspace on March 21, 2008 by Brian Auer. As photographers, we can all agree that the camera is one of our most important tools of the trade. But photography is much more than taking pictures — that’s the easy part. Photos need to be managed, organized, and processed. Thus, an equally important tool for the digital photographer is the photo management software we use. Having tried several methods of file management, I’ve settled on Adobe Bridge as my choice software. In this article, my goal is only to introduce the concept of using Adobe Bridge as a file management tool. I won’t get into any of the specific features or operations — we’ll save that for the next several articles in this series. Adobe® Bridge CS3 is a powerful, easy-to-use media manager for visual people, letting you easily organize, browse, locate, and view creative assets. Available in all six editions of Adobe Creative Suite® 3 software and all professional Adobe creative applications, Bridge provides centralized access to project files, applications, and settings, as well as XMP metadata tagging and searching capabilities. At its roots, the software is a file viewing and management tool. As photographers, we can rely on Bridge to work with our photographic files, including JPEG, TIFF, and RAW formats. We’re all familiar with browsing and viewing files from within our operating systems, and Bridge works in much the same way but with so many more features. Not only can we view files and folders, but we can also add many levels of organization and structure to our photo collections. Bridge offers the ability to manage metadata and to find files by utilizing that metadata. The software also integrates with Adobe Photoshop and Adobe Camera Raw so that our photo editing tasks and workflow become extremely simple and streamlined. WHAT CAN BRIDGE DO FOR YOU? Bridge offers the ability to view, edit, and search files and file metadata… not just some of it — all of it. On the surface, it looks very similar to a typical file browser. But dig a little deeper and you’ll find that Bridge offers access to information you didn’t even know existed. Camera settings, keywords, author information, dates, times, locations, genres, categories, titles, descriptions, copyright, and the list goes on. The software also allows you to interface with your operating system file structure and organize files as you see fit. Entire collections of photos can be created, tagged, labeled, renamed, moved, and accessed via Bridge. 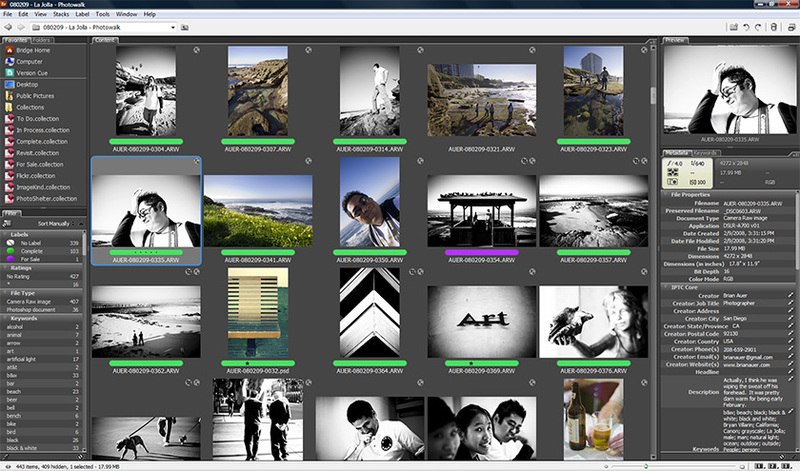 File management and photo editing tasks can be automated for increased productivity. Photos can be processed in large batches, and metadata can be modified much in the same manner. The whole reason for applying all of this extra information is so we can find our files when we need them. 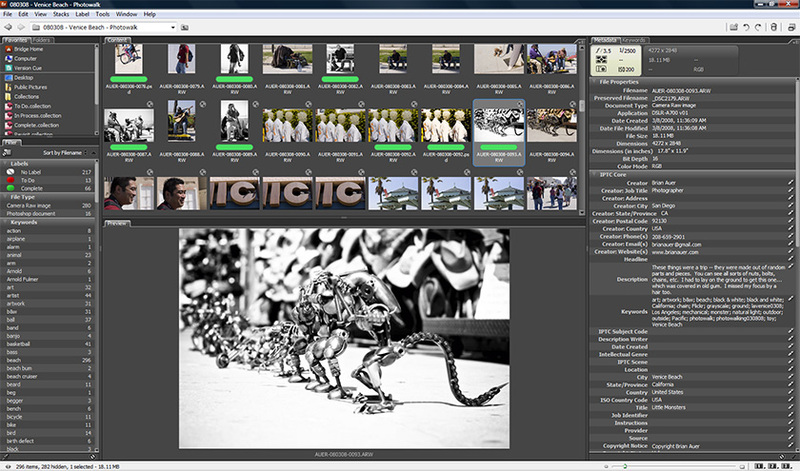 Adobe Bridge is well geared for advanced search capabilities. Search results can be further filtered and refined to reduce the amount of extra information presented. Collections can be created to give you quick access to common search queries. But being able to locate files based on metadata relies solely on your willingness to spend the time and effort applying that data to the photos. 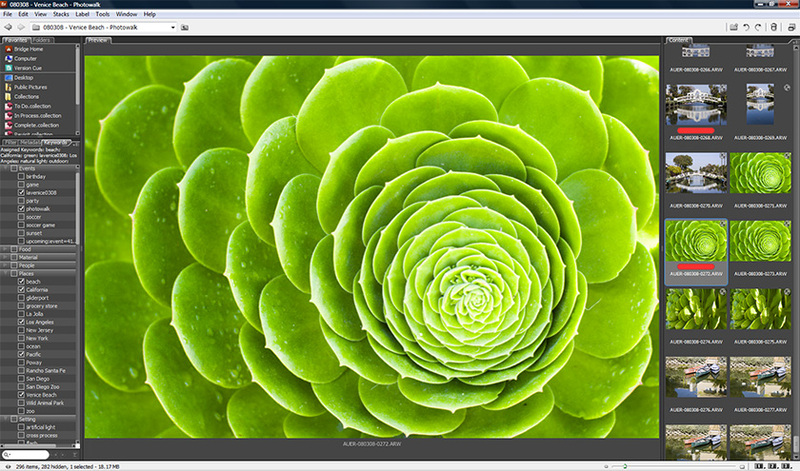 Adobe is an industry leader when it comes to photo processing software. Based on our recent poll regarding photo editing software, 40% of you use Photoshop and Adobe Camera Raw (ACR) as your main processing software. Another 28% use Lightroom, and 4% use Photoshop Elements. This gives Adobe nearly 3/4 of the market share. Clearly, Adobe is a trusted brand with a huge following of photographers. My fears of Adobe products disappearing any time soon are quite low. As an Adobe product, Bridge integrates seamlessly and fluidly with Photoshop and ACR – it is the bond that ties everything together. The software gives you the ability to automate and batch process photos with Photoshop and ACR. The software interface is simple and intuitive, and though it provides a lot of bells and whistles, the controls aren’t overbearing or in the way. The other great thing about Adobe Bridge is that the metadata is applied directly to the files (or accompanying XMP files in the case of native RAW photos). This means you won’t have transfer issues in the event of switching computers, updating software, or even switching software. Many other pieces of software rely on database systems to keep track of files, which can prove to be a headache in the event that the software ceases to exist. With the current Creative Suite products from Adobe, Bridge is not offered as a standalone software package. It is included with most of the CS3 product lines, including Photoshop. So if you want to get your hands on Adobe Bridge, you’ll need to first get your hands on Photoshop. Since Bridge comes with Photoshop, you’ll need a computer that can run Photoshop. The latest versions of Photoshop are becoming evermore taxing on computer resources, so a fairly quick computer is needed (processor, RAM, hard drives, video card, etc). Bridge is also a resource-taxing piece of software. The ability to handle a large number of large photo files relies heavily on your computer, so make sure you can meet the minimum requirements for Photoshop. Often, just meeting the minimum requirements will prove to be frustrating at best. I recently upgraded my entire computing system and I’m still finding ways to tax the hardware with Bridge and Photoshop. Currently, I’m running a Windows Vista PC with a 3GHz AMD Athlon 64 X2 Dual Core 6000+ processor, 3GB of RAM, and a SATA II hard drive (3Gb/s). I still run into occasions when I need more juice. If you’re not serious about getting a capable computing system, you’ll find yourself doing a lot of waiting and getting frustrated. Now that the introductions are out of the way, we can move forward with some specific features and operations in the software. In the next article, I’ll cover the Bridge workspace setup, important settings, and importing photos (if time permits). If you’re currently using a different piece of software to manage your photos, read through my next several articles and ask yourself if you can (or even want to) do the things I’m showing with your software. Also look at your own software features and ask me if Bridge can do something similar — everybody has different wants and needs in software, and I can’t possibly guess all of them. This entry was posted in Features, Productivity and tagged acr, adobe, adobe bridge, adobe cs3, adobe photoshop, bridge, computer, creative suite 3, cs3, digital, digital photography, file management, foto, management, organization, organize, photo, photography, photos, photoshop, Productivity, software, structure on March 17, 2008 by Brian Auer. When the wind is just right, the skies above Black’s Beach team with para gliders and hang gliders. This particular shot was taken at a 10mm focal length (15mm full-frame equivalent) as I stood very near the edge of a 300 foot sand cliff above the Pacific Ocean. The gliders ride the updrafts as the wind comes off the ocean and shoots straight up along the face of the cliff. These thrill seekers can ride these winds for extended periods of time and never lose altitude. 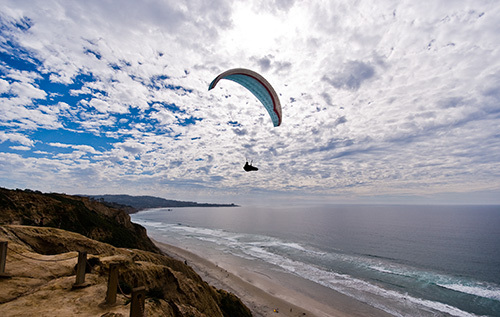 The Gliderport is located on the Torrey Pines State Reserve, nestled between the beach towns of La Jolla and Del Mar. La Jolla can be seen in the background of this photo as it extends out into the ocean to form a point. And those little dots on the sand below… those are people. All of the following post-processing steps were done with Adobe Camera Raw — no Photoshop was used on this photo. This is what the image looked like straight out of the camera. Not too shabby, but it needed some work on a few areas. I decided to keep the color on this one because of the sky in the upper portion of the image. I set the white balance to a temperature of 5500 and a tint of +8. Then I brought the exposure to -.5, set the recovery to 100, no fill light, blacks at 13, brightness at +14, contrast at +35, clarity at 35, vibrance at +17, and saturation at +7. Do note that a lot of these settings weren’t made in this order — there’s a lot of back-and-forth between these settings and the settings on the other two panels I used. I set a “strong contrast” on the point curve, and added some extra contrast on the parametric curve with highlights set to -28, lights at +26, darks at -13, and shadows at -4. In the detail panel, I set the sharpening to an amount of 50 and a radius of 1.5. In the lens corrections panel, I added some positive vignette. So instead of darkening the corners, I lightened them to even out the image and brighten the foreground. At 10mm, my lens tends to produce a slight amount of vignette, so I punched up the value in ACR to +50 with a midpoint of 0. I lost some contrast in the clouds (which I over-contrasted just for this reason), but I gained a whole lot of brightness in the lower left corner. This entry was posted in PhotoBlog and tagged acr, adobe, adobe camera raw, adobe photoshop, art, art and photography, beach, Blacks Beach, blue, brown, California, chute, cliff, clouds, color, cs3, fly, foto, image, La Jolla, ocean, outdoor, outside, Pacific, parachute, paraglide, paraglider, people, person, photo, photography, photos, photoshop, raw, recreation, San Diego, sea, sky, sport, water, waves, white on March 6, 2008 by Brian Auer. 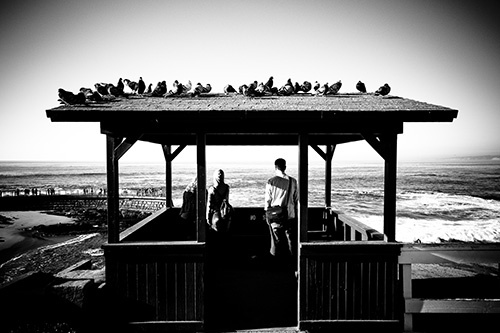 This shot was taken during the La Jolla photowalk in early February. At the time, I found the scene to be very interesting — the hut, the birds, the people, and the ocean in the background really seemed to work together in this candid shot. I kept things fairly well centered because of the strong symmetry already present in the hut. The Birds and the people served to break up that symmetry in isolated areas, so I didn’t feel I needed to break it up even more. Lucky for me, I also left some extra room at the top of the frame, which served as a nice backdrop for some heavy vignette. This is what the image looked like straight out of the camera. It could probably work as a color image too, but I wanted to go colorless. Before doing anything, I switched to grayscale. I pushed the red, orange, yellow, green, and aqua to negative compensation while the blues, purples and magentas were pushed in the positive direction. I left the white balance set at a temperature of 5800 and a tint of +3. I left the exposure, recovery, and clarity set to zero, while I boosted the fill light to 46, bumped the blacks up to 36, dropped the brightness to 16, and pushed up the contrast to 52. Using the parametric tone curve, I set the highlights to +41, lights to +39, darks to -44, and shadows to -76. This gave me the strong contrast I was after, and I actually pushed a bunch of the highlights and shadows off the histogram. In the lens correction menu, I set the vignette to an amount of -76 with a midpoint of 19 — and this gave me the strong frame around the hut while filling in some of that sky. As a last step, I set the sharpening under the detail menu to an amount of 50 with a radius of 1.5 pixels. This entry was posted in PhotoBlog and tagged acr, adobe, adobe camera raw, adobe photoshop, animal, art, art and photography, b&w, beach, bird, black, black & white, black and white, California, cs3, female, foto, grayscale, green, image, La Jolla, male, man, natural light, ocean, outdoor, outside, people, person, photo, photography, photos, photoshop, photowalk, photowalk020908, photowalking020908, raw, roof, sand, sea, seagull, water, white, woman on February 28, 2008 by Brian Auer.